We've always supported exporting calendars to listing sites via iCal. We've received a lot of recent requests to be able to do the opposite -- import bookings/blocked off time from other listing sites via iCal. Today, we released an update that adds two way sync support! 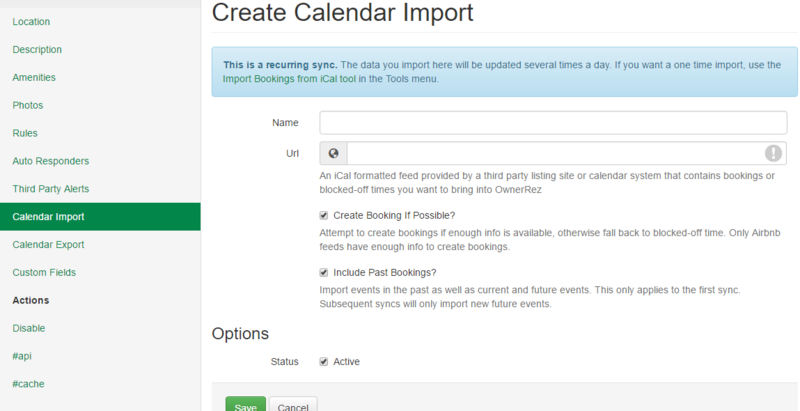 To set this up, you'll need to set up calendar import and export in each property. Export is already covered in our Hook up iCal availability calendars to update listing sites article. When you create the import for the first time, it'll do an initial pull of items from the calendar, then automatically update every few hours. You can view the last status in the log under the calendar import. Currently, only AirBNB provides enough information in their iCal feeds for us to create bookings. If you want bookings with guest info and charges from other sites, you'll need to add that information by hand. For other feeds, go into the blocked off time and use the new "Convert to Booking" button to convert the block off to a booking. If you have any ideas or find iCal feeds that we don't support, let us know and we'll look into it. I just did this for my property at 202 Dunes. I just booked August 29--Sept 3, and when I attempted to import got an error message. There is not another booking there, can you please check this out and let me know whats going on? Sure. What's the iCal URL you are using? I had a look at the sync in your account and it does look like it is working. It says "failed, skipped" for some of the bookings because there are already manually added bookings, but the overall sync did complete. I realize that's a bit confusing, so I'll work on improving the messaging around that. ab79a247-6164-44c6-8a8e-63f1876ea48f (8/29/2016 to 9/3/2016) failed: Skipped because something exists. Now when you look at my calendar for this property, you will see nothing exists for the dates of 8/29--9/3. I have someone that checks in on the evening of 9/3, but this shouldn't prevent a check on the morning of 9/3. Yep, good catch. I had assumed you were worried that the entire feed was failing. I found a logic issue that was keeping that block from being created. Check now and it should be in place. I have the same problem I think. I added a booking in OwnerRez for check-in on Sep 15 with check-out on Sep 18. It wouldn't sync in HomeEscape so I had to add it manually. I think it wouldn't sync because I already had someone checking in on Sep 18th. How do you force a calendar sync? We don't have a button for that yet, but it is coming in the next hotfix (sometime this week).